Professional digital illustrators reveal the techniques they use to add emotion and drama to their images. It's short on technical detail, but Beyond Art Fundamentals is a great guide to bringing emotion into your work. Beyond Art Fundamentals looks at how moods and feelings are the key to creating successful art that sticks in people's memories. 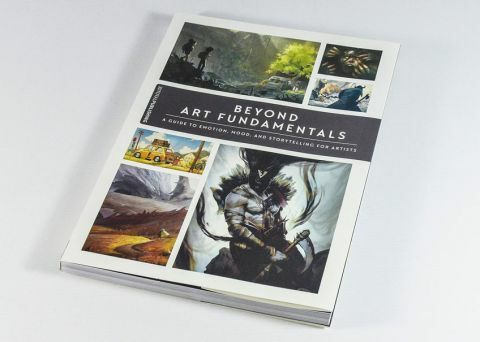 Following a short introduction by the editor, Beyond Art Fundamentals is split into three main parts. The bulk of the 222-page softback is devoted to the Emotions section, where 18 artist tutorials reveal how different moods such as anger and nostalgia can be interpreted. These articles follow the development of an image that conveys a certain feeling, with each one offering unique takes on composition, character details and general working practices. The remaining quarter of the book is set aside for a cooperative project, where two artists tackle the same topic to reveal how collaboration can produce the best work, before closing with a gallery in which artists discuss their creative process. Beyond Art Fundamentals might not be the most technical book around, but considering that it deals with something as personal and abstract as emotions, this doesn't matter. Furnished throughout with beautiful images, there's a wealth of advice and insight here for hobbyists and skilled artists to enjoy.